Writer-producer Jimmy McGovern’s “The Street,” which follows the individual stories of neighbors living on the same road in Manchester, received the Emmy for best drama series. Hoskins took the best actor award for his role in the 2009 season of “The Street” as a recovering alcoholic pub owner whose morals lead him to stand up to the local gangster. Bonham Carter portrayed the popular British children’s author Enid Blyton, whose escapist fantasies stood in contrast to her dark and troubled family life. The other British winners announced at the awards ceremony, hosted by former “Beverly Hills, 90210” star Jason Priestley, included “Shaun the Sheep” in the Children & Young People category and “Small Island” (TV movie/mini-series), based on Andrea Levy’s novel about the lives of Jamaican immigrants who face racism and poverty in London during and after World War II. While Britain got its share, the remaining awards were spread out among five different countries. Thirty-nine nominees from 15 countries were contending in 10 categories for International Emmys, honoring excellence in TV programming outside the U.S.
Israel’s “Traffic Light,” about the friendship and romantic relationships of three 30-something childhood friends, was rated the best comedy. In the telenovela category, Portugal won its first-ever International Emmy for “My Love,” which follows three women whose lives intertwine after a plane crash. The non-scripted entertainment award went to the Argentine weekly satirical news review, “CQC,” which finally won its first Emmy after being nominated nine times since 1999. Two non-fiction shows about struggling underdogs also received Emmys. South Korea’s “Mom and the Red Bean Cake,” which tells the story of a single mother with terminal stomach cancer who supports her family by selling cakes, was chosen the best documentary. The arts programming award went to Romania’s “The World According to Ion B.,” about a homeless man living in Bucharest who became one of the country’s leading contemporary artists after his collection of collages was discovered by a young gallery owner. Cowell’s “X Factor” and “Got Talent” talent show franchises have been adapted by broadcasters in dozens of countries, and he has used his international celebrity to raise tens of millions of dollars for children’s, animal welfare and other charities worldwide. “Late Night” host Jimmy Fallon presented the International Emmy Directorate Award for longtime achievements by a television professional to his mentor, Michaels, who has helped launch the careers of several generations of TV and film comic stars since “Saturday Night Live” premiered in 1975. Among the presenters at this year’s awards ceremony were TV newsman Bill Moyers, “Mad Men’s” Elisabeth Moss, nonagenerian actor Eli Wallach, Broadway star Christine Ebersole, Matthew Modine, Melissa Joan Hart, and Brazilian actors Alinne Moraes and Bruno Mazzero. 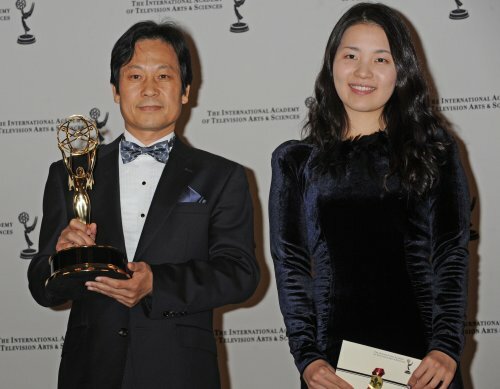 The awards are sponsored by the International Academy of Television Arts & Sciences, which includes media and entertainment figures from more than 50 countries and 500 companies.